Forget the usual stereotypes of IT and marketing. Start with the assumption that all marketers and all IT people are smart, talented, enthusiastic, and dedicated to the success of the company, above personal preferences or departmental jockeying. They’re each very good at what they do. So why is there such legendary frustration at the intersection of the two? The gap that is the marketing/IT divide is, in my opinion, not a matter of personality — as often humorously portrayed — but rather the result of structural differences in their organizational missions. ongoing support, maintenance — who takes care of it? IT has a relatively conservative agenda. Indeed, these are legitimate priorities for IT — the issues they should be concerned about — for which they have significant expertise. Rapidly tinkering with new and potentially unstable ideas, on a let’s-see-what-happens basis, is generally not encouraged. For most of its projects (and budget), IT favors solid architecture over loose experimentation. That’s not to say that innovation isn’t also important to IT — it is. It’s just often not as important as these other responsibilities. For most marketers, what worked yesterday as the status quo is not good enough tomorrow. Markets are in constant flux, and there is an insatiable demand for more: more prospects, more customers, more sales, more brand recognition, more channels, etc. It creates a culture of chasing the leading edge, the next new thing, and that’s inherently unstable. Marketing certainly respects stability, security, standardization, etc., but those ideals are often abstract and distant compared to — and sometimes in opposition to — their primary mission of reaching more people more quickly. Gabriel Bitran, a professor at MIT Sloan, summed it up: structure dictates behavior. The incentives and priorities that people are given will be reflected in their actions. IT and marketing are each pursuing their mandated objectives — unfortunately, those objectives easily conflict. The explosion of digital marketing has, unfortunately, only exacerbated this problem, as marketing is increasingly dependent on a continuously evolving stream of leading edge technologies to realize its objectives. This is widening the gap. To a certain degree, IT and marketing should conflict. Businesses as a whole succeed by balancing competing priorities. You need to have both IT infrastructure stability and innovative marketing experimentation, in some reasonable proportion to each other. The ideal point of that fulcrum depends on your particular firm and its strategy. The first part of balance is knowing where to put your weight. IT and marketing should evaluate projects by their relative need for each other’s structural emphasis. Compromise often requires leaning to one side or the other. For instance, your core CRM database is probably a better match for IT architecture than, say, social media marketing tools. When initiatives are more suited to marketing’s agenda, a growing array of software-as-a-service (SaaS) products for marketing is enabling those technology solutions to be more easily sourced from external vendors, with minimal dependence on IT. It’s now feasible for marketing to have its own technology sandboxes, making it more of a strategic question — in that balance between IT and marketing — as to where particular components live. For example, in the case of my SaaS company, ion interactive, we believe that landing pages and other campaign-specific post-click marketing initiatives are better suited to rapid experimentation — with minimal or no IT involvement. This is in contrast to a firm’s primary web site, which often has deep connections into IT back-office systems. The line is drawn between what is more advertising-centric versus what is more internal operations-centric. But software is only a part of the solution. The process of choosing the right software, making sure that the technical details are compatible with the business objectives, and weaving multiple solutions together so that they “integrate” with each other and the touchpoints with a company’s internal IT infrastructure still requires technical leadership. This is the role that I see a for a chief marketing technologist (or director of marketing technology, if you prefer): providing technical leadership for marketing technology that is not primarily owned by the company’s IT department. The incentives for this role should emphasize marketing’s agenda of experimentation and innovation at the edge, but with enough respect for stability, security, and long-term architecture to assure that aggressive ideas aren’t reckless. A chief marketing technologist should also serve as the primary liaison between marketing and IT, helping to negotiate the balance point for different projects and seeking ways to maximize synergy and hybrid solutions. There may always be some tension between marketing and IT, simply because of their different positions in the spectrum of a company’s overall structural needs. But understanding the root of this dynamic, and minimizing its friction by facilitating a smart and responsible division of responsibilities in marketing technology — including independence for marketing’s own technology sandboxes — can make everyone happier and more successful. I feel sorry for those companies that let IT run the web. The web is about running the business. Since it is virtual it lends itself to more rapid changes than other infrastructure like buildings, assembly lines, LAN structure etc. However, my 2 cents would be to argue that marketing and sales are only one part of the website / web releations. You have to build all functions the company excercises on the web too. For instance Customer Support and Customer Relations. There is a difference between new sales and the aftermarket. On top of that there are some things within Customer Relations that are (only) possible using the web: Added values like White Papers, Seminars, Videos, Screen Casts and so on. This also includes (business)knowledge sharing. As I see it the there need to be a second copy of each company on the web and neither IT nor Marketing are fit to be the sole responsible departments. For the time being I would argue for a supporting “Web Department” because of the rapid developent in the area. In my experience IT and Marketing have too many other responsibilities to be able to keep up with this developement. So far. What a great explanation of the problems. Certainly anyone who’s ever tried to get some SEO recommendations implemented on a fairly large company’s website has had to deal with this. The way you’ve explained it makes a lot of sense. A marketing technologist role within these companies would seem to help solve a lot of the problems. 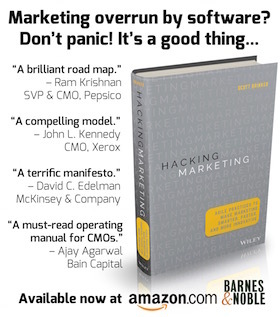 Funny that you should get into the difference between marketing and IT, I just wrote about that a few months ago. Check it out. Excellent article. You’ve hit the nail on the head. I agree with Jill’s comments. They apply equally well with trying to run Adwords campaigns. Testing new landing pages for Adwords campaigns can be interesting at times especially when radical changes to the web page design are called for. Usually it’s an IT person who controls the web design template and trying to get them to see the marketing angle to the changes you need to introduce to “just a few pages but not the whole site” requires a certain degree of patience and persistance. Chris, you make an excellent point: the challenges of balancing competing priorities clearly extends beyond marketing and IT into customer support, sales, operations/fulfillment, HR, investor relations, etc. I like your idea of a “web department”, kind of a Switzerland of a fractured corporate web space. A slightly different approach, however, might be to make the web space in a company even *more distributed*, giving departments even more control over their individual pieces — and reserving coordination for just enough of the technical, user experience, and organizational continuity to make it seamless from an outside user’s perspective. Both approaches have the same goal: reduce bottlenecks, enhance agility. Jill, I can imagine that SEO is probably *the most* challenging collaboration for marketing/IT, since it intertwines both technical setup and publishing processes with the need for a tremendous amount of marketing effort for information architecture and content strategies — across a company’s entire web universe. And it’s not a one-time deployment, but a constantly evolving landscape. I agree, a strong marketing technologist should have SEO near the top of their list and should be able to accelerate that ongoing mission. Doug — great post of yours. Thank you for sharing. Mike, seeing the success of IT and software folks cross-over into marketing — not common yet, but usually quite successful when it happens — is very much the inspiration of formalizing a chief marketing technologist role. As for testing new landing pages for AdWords campaigns, especially when radical ideas need to be explored: I don’t mean to plug my company too much here, but the landing page management SaaS we developed was built with that exact challenge in mind. More broadly, I think these independent technology sandboxes — as long as they adhere to certain standardized rules that a company needs to maintain globally — can help make a company’s online presence more scalable by being more distributed. Yeah, it’s so much a problem with SEO that we’ve found one of our main roles is to try and bridge that IT/Marketing gap by doing some in-house classes about SEO with both teams in the room. If you can get both IT and Marketing excited about SEO and also to understand their respective roles, a lot more usually gets accomplished. I am in I.T. and the one things I find very irritating is when marketing strike deals with affiliates on systems that are brand new concepts. They then turn around and say “This needs to be done urgently”. Everything is so urgent. Ring any bells? I.T. is about prioritizing. It makes I.T. very un-productive as you find yourself having projects being constantly interupted. This is not the way I.T. works and marketing people should respect that. I disagree with the first poster chris. I.T. should call the shots / advise etc… as we are the ones that have the technical know-how and also look after and fix it when it all goes wrong. What is needed is a ‘Business Anaylst’ from the I.T. department will go and speak to the people involved in the Marketing department. They create a specifiaction and when both departments agree on the specification the I.T. department starts work on it. Change this, change that every other day to see if we can increase the traffic by 1%. God it is so irritating. There thats my rant over, don’t really care what your comments are as I have worked in I.T. for 20 years or so and I know that I am right, especially when I have met so many other I.T. Professional who feel eactly the same if not stronger. I work in I.T. is well and I have to agree with you 100% especially the “change that every other day to see if we can increase the traffic by 1%”… Specifications are there for a reason and should be reviewed by both teams involved as change code can lead to web security issues, web server issues etc if not reviewed in the right manner. Things are changing, and those that dont get it (not matter how many years experience) will have a problem. CMOs are creative and will find a work around, specially now with the SaaS options.The big concern i have noticed is the use of data. I work for an very big and tradicional European company and now all cloud solutions are forbiden. Our IT guys (with more than 20 years of experience) will never match Sillicon Valley´s skills, but we can’t trust our data to them either. Sofar only big marchtech projects have been successful around Social Media, were the data is already of public domain. Any other ideas of project that could also work?